Beautiful sofas and chairs and two fabulous contemporary dining tables define our latest arrivals this week! Browse below, then stop by Tuesday-Saturday, 10AM-6PM at 2237 NW Raleigh St, give us a call at 503.222.6122 or email us at home@seamstofit.com with any questions. Remember Seams to Fit Home lovers; we cannot feature all of our items here, but we do feature additional gems on our Instagram and Facebook pages. Make sure you follow us, so you are up to date with other fabulous items: http://instagram.com/seamstofithome or https://www.facebook.com/seamstofithome. Modern gray Caesarstone cut into a perfect 4-foot square, rests atop a simple metal pedestal base, making this dining table an easy fit for any style. Measuring 29″ high, we have it priced at $1000–SOLD. Set around the table are four vintage Marcel Breuer for Stansel ‘Cesca’ arm chairs, straight from 1968. 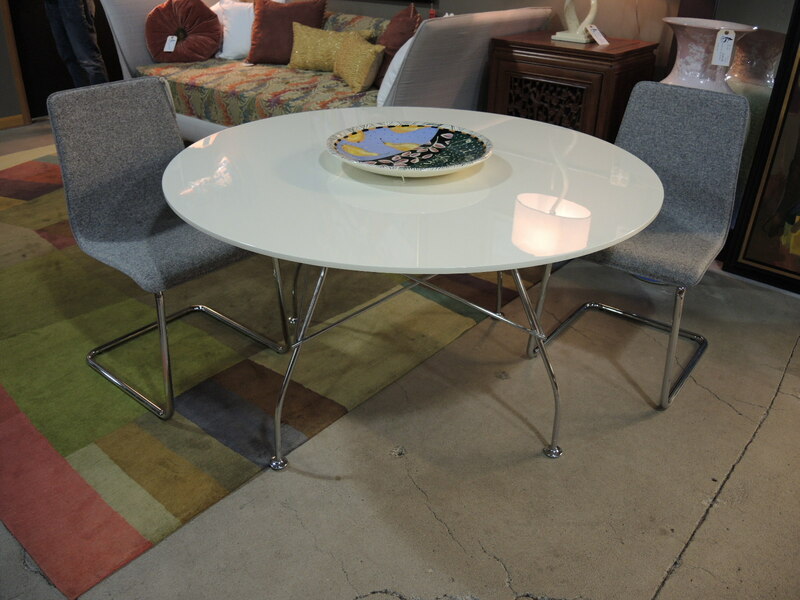 With caned maple and chrome base, these originals are in pristine condition, and priced at $1600–SOLD. 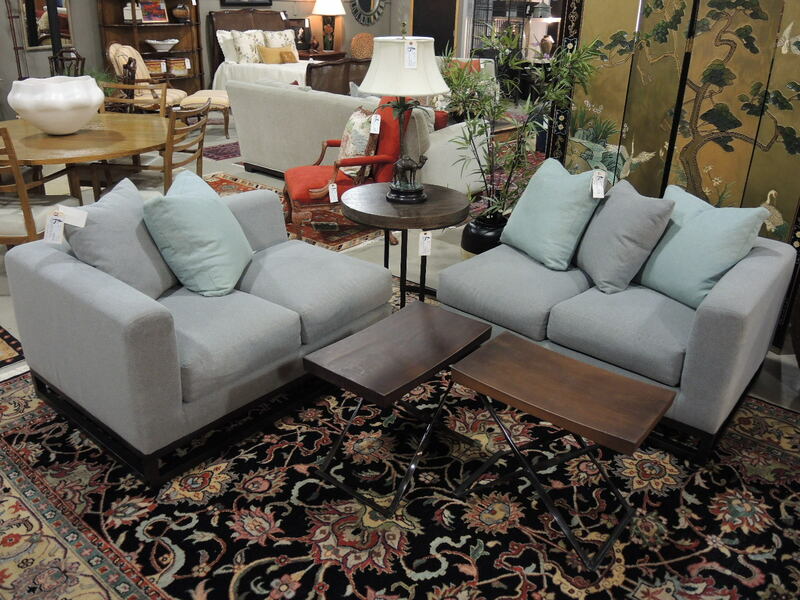 With versatile arrangements, this two-piece loose cushion sectional can be separated into two one-arm loveseats, or extended together into a sleek 8.5′ four-cushion sofa. A dark wood open-frame base provides sophistication, and the simple track arms add versatility. 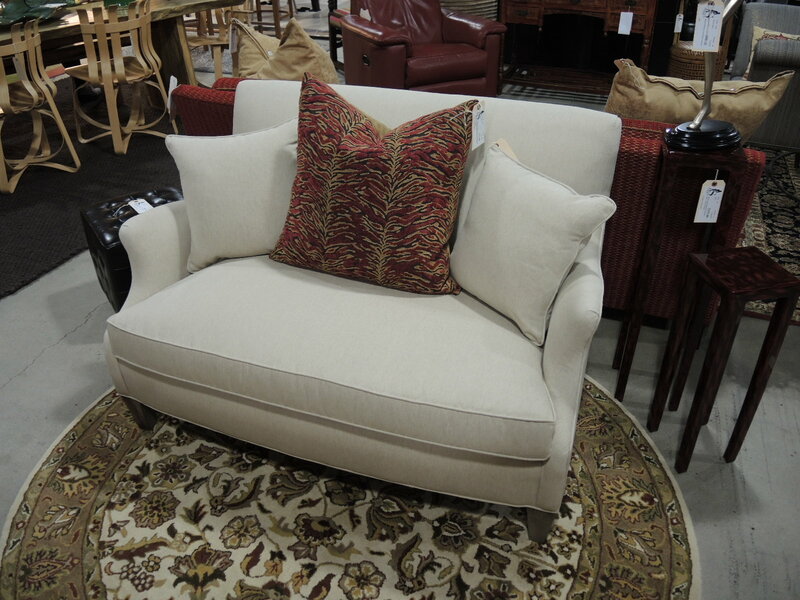 Measuring 51″W x 36″D x 26″H for each section, we have the sofa priced at $895–SOLD. Centered into the corner section is a round slab wood occasional table with an angular metal base from Bernhardt, priced at $295–SOLD. A fantastic contemporary dining table from Kartell, we have this white-lacquered polyresin dining table on a chrome-plated steel base. Made in Italy, and designed by Antonio Citterio and Oliver Law, it measures 51″ wide and 28.5″high. 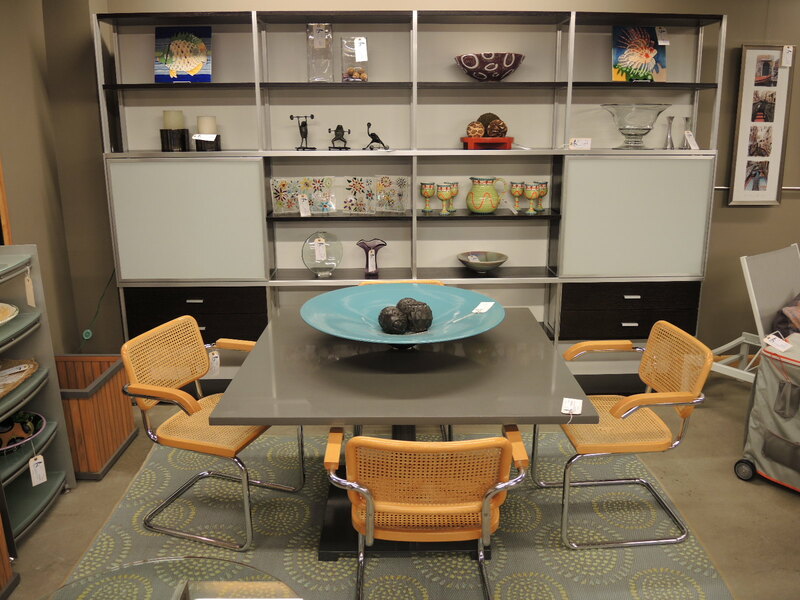 Originally retailing for $1900, we have it priced in our showroom at $895–SOLD. 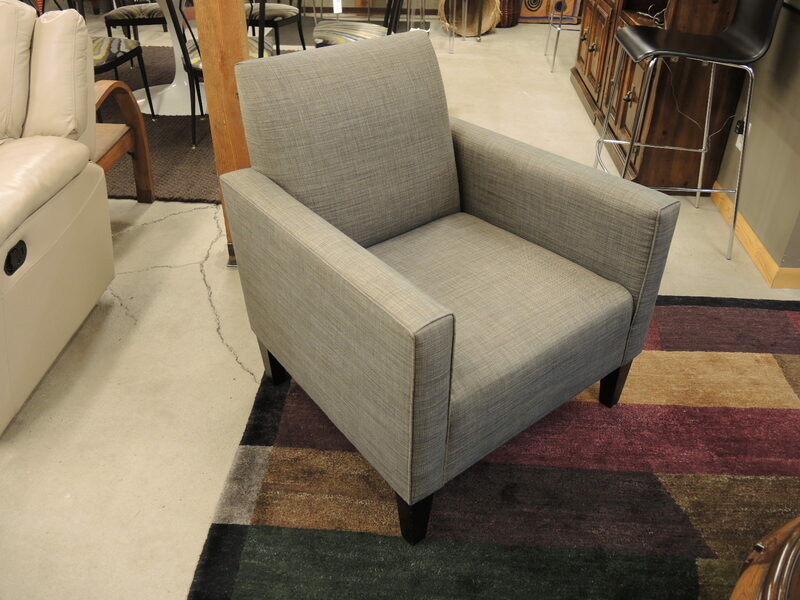 Paired with it are two gray tweed side chairs with chrome cantilever bases, priced at $195 for the pair–SOLD. Brand new delivered to the showroom, wrapped and crated, we have this pristine ‘Hudson’ settee from Ballard Designs. With down-wrapped foam cushions, a high-back and two matching throw pillows, it provides a great apartment sofa option. Measuring 51″W x 33″D x 36″H, we have it priced at $995–SOLD. Adding playful color is a raspberry chenille and tan animal-print pillow from DV Kap Home, priced at $75–SOLD. 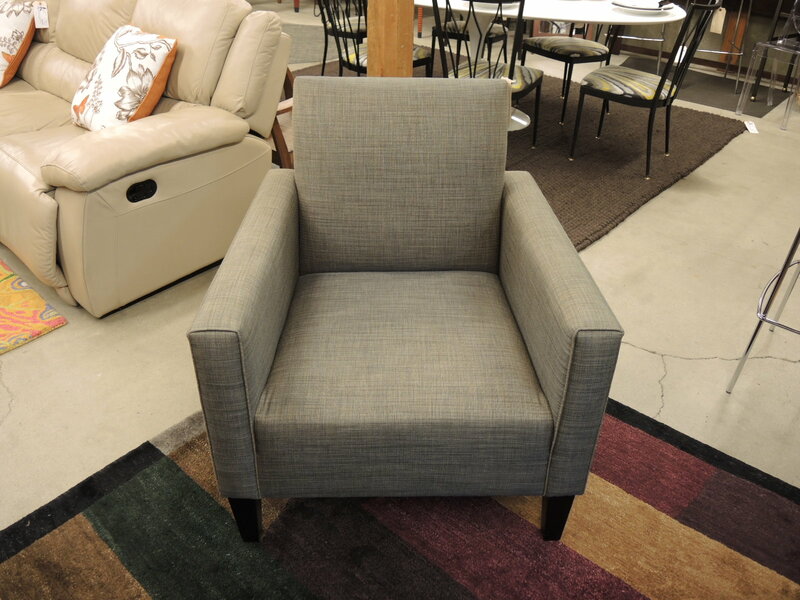 Sleek comfort defines this gray upholstered armchair. With strong, clean lines and espresso-stained wood block legs, this beautiful chair measures 31.5″W x 31″D x 34″H and we have it priced at $395–SOLD.